The summer months are a great time to enjoy the wilderness. The outdoors are full of life, change, and beauty. That being said, summertime has its dangers for those who aren’t prepared. Excessive exposure to the hot summer sun can lead to more than the common sunburn. There are many different types of health or medical problems that can arise if one is not prepared. As the old saying goes; knowledge is power. Knowing the signs and symptoms of heat illness is something everyone should consider. Getting out and enjoying the summer weather is great fun. However, you should monitor yourself and others, especially children and the elderly. Here, we’ll talk about heat exhaustion and heat stroke, and the differences between them. Heat exhaustion and heat stroke (sunstroke) are similar. They share many symptoms. 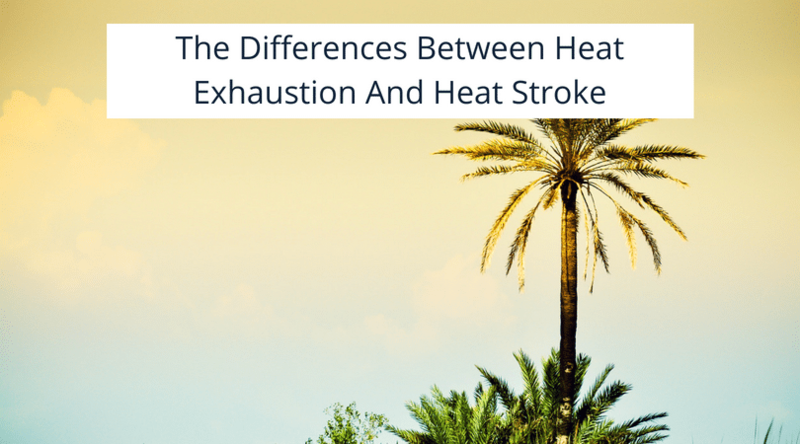 The main difference is that heat stroke is a much more severe form of heat exhaustion and the symptoms are intensified to a point that permanent damage to the brain or organs can occur if left untreated. Heat stroke and heat exhaustion both have similar symptoms, here is a list of the shared symptoms between the two medical conditions. Heat exhaustion can lead to heat stroke if it isn’t managed and treated. Heat stroke, by definition, is a core temperature above 105F (40.5C) degrees. Having an elevated temperature but not over 104F (40C) is considered heat exhaustion. If you let heat exhaustion progress to heat stroke, you should seek medical treatment immediately. Know the risks; if you are alone, you should be aware that if your symptoms progress to heat stroke, you may have trouble thinking. Not being able to think clearly can make treating yourself more difficult or impossible. As an individuals core temperature rises, their system attempts to compensate by transferring core body heat to the blood stream and skin. When someone is experiencing heat stroke, their body is essentially shutting down and going into a crisis mode. High heat index. (wet bulb temperature) Heat index is an indicator of humidity and temperature. When the air is too humid, the sweat on your skin may evaporate too quickly. Reducing the efficiency of the body to cool itself. Obesity. Bodies retain more heat when they are heavier. Being obese can make you more susceptible to heat exhaustion and heat stroke. Heavy-set people may not be able to cool themselves as effectively with sweat. Medications. Some prescription medications can alter or change heart rate and blood pressure and or hydration. This can impact a body’s ability to cool itself effectively. Know the side effects of your medications before you head out. Temperature changes. If you are from a cooler climate and take a vacation to a hotter environment, you could be at risk. It takes time for a body to adjust to temperature changes, and a sudden change could increase your risk of heat illness, such as heat stroke or heat exhaustion. Age. Adults over the age of 65, infants, and children under the age of 4, are more vulnerable to heat related illness. In the case of children, their bodies haven’t fully developed and may not be able to regulate themselves properly. Older folks may also have difficulty staying hydrated and sweating. Heat related medical conditions are something everyone should consider when enjoying the warm weather. It’s important to monitor yourself and others for the early signs. Remember that if you are thirsty, its a sign that you are already dehydrated. Although they share some commonalities, heat stroke is a much more serious condition where permanent brain or organ damage can occur.